Curious Film has generously given Eating Adelaide a double pass to give away to the film Jiro Dreams of Sushi. Jiro Dreams of Sushi documents the life of Jiro Ono, the most famous sushi chef in Tokyo. 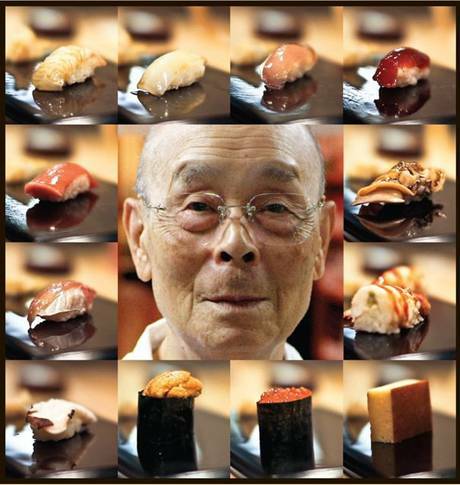 Ono is 86 years old and runs the three Michelin starred restaurant Sukiyabashi Jiro. There are just 10 seats in the restaurant and you can expect to book a year in advance. If you can’t get to Tokyo and you can’t wait a year, you can now make do with the film. It opened nationally (Australia) on 10 May. The double pass is an in season pass valid at the following cinemas: Chauvel Cinema, Palace Centro, Palace Nova Eastend, Cinema Paradiso and Greater Union Manuka. To enter: leave a comment below (use the same name as you use on Facebook please!) AND ‘Like’ Eating Adelaide on Facebook. As the film has already opened, this competition will run until midday (CST) on Wednesday 16 May, so you only have a few days to enter. The winner will be drawn randomly – there’s no skill involved other than remembering to comment AND like on Facebook. I enjoy your reviews (especially the baby friendly factors to consider)…. Have alway had a soft spot for Japan & Sushi!! Ah, I heard of this film from a friend the other day.. I’d love to watch it, Japanese cuisine being one of my top cuisines to eat and cook! I agree with Lyndon 🙂 And sushi is such an artful food, I’m not surprised it makes a great topic for a film. I reckon you’d have to have some pretty special plan lined up for a post-movie meal after seeing this though. To watch all the fabulous sushi-ness happen and then eat some really poor Aussie sushi would be really, really terrible! Kenji + Sushi movie sounds like a great night out!